Word of advise.....Never watch Dexter when your husband is working all night. I've certainly had my fair share of dumb ideas but this is the DUMBEST idea ever! I should be watching Little House on the Prairie or something like that....not Dexter. But here I am watching it as I type, thinking of a plain of attack.... just in case bad scary stuff happens tonight. Well I made some cupcakes for you today. I just used a vanilla box mix and topped with almond buttercream frosting. Then I drizzled red tinted buttercream that was thinned down on top of cupcake. It's simple and easy. I topped the cupcakes with mini royal icing knives. tape a sheet of wax paper over a printout of a knife. Next simply pipe over knife design. Allow to dry. Add silver rivets on knife handle. (not shown in picture) Allow to dry over night. Be sure the knives are completely dry. Make extra to allow for a few breaking. No matter how careful you are, a few WILL break. After knives dry completely, carefully remove from wax sheet. 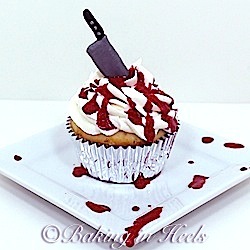 Insert knife into top of cupcake.